Google announced the second smartphone in the Nexus series called the Nexus S. The first Google phone Nexus One was manufactured by HTC, and now the Nexus S is from Samsung. Nexus S is the fist mobile device to get the new Android OS 2.3 Gingerbread. Google and Samsung co-created Nexus S hardware in a close development phase, to include all features of the OS 2.3 in Nexus S, including NFC and others. Specifications of the Nexus S have some similarity with the hugely popular Samsung Galaxy S Smartphone. It is also the first smartphone to include a contour display that fits perfectly in the hand. Nexus S will be sold from Google’s selected online partners from December 16 2010 onwards. The notable feature in Nexus S is the 4 inch super AMOLED display with 480×800 (WVGA) resolution. The advantage of the Super AMOLED display is the improved brightness, less sunlight refection and reduced power consumption. It has a pixel depth of 235 ppi that let you view the fine details of images and videos; crystal clear and at great clarity. As we have mentioned earlier, Nexus S uses a contour type glass screen for perfect visibility. Nexus S comes with all features of the Android OS 2.3 Gingerbread. Three-axis gyroscope and the NFC hardware support in Nexus S is enabled by the new OS. The gyroscope setup will improve the gaming and use interaction detection on the device. Nexus S comes with ARM Cortex A8 1GHz Hummingbird processor CPU with inbuilt graphics processor. The device has 512 MB of RAM and 16GB iNAND for memory storage requirements. Nexus S supports almost all GSM-3G networks in the world. This quad-band GSM, Tri-band 3G smartphone has HSDPA (7.2Mbps) HSUPA (5.76Mbps) connectivity. The camera hardware in Nexus is similar to the Samsung Galaxy S. There is 5MP main camera in the back side, with Flash, Auto Focus and support for HD video recording. In addition, a front facing VGA camera for video calls. Other features of the Google Nexus S include WiFi, Bluetooth with A2DP, A-GPS, accelerometer, digital compass, 1500 mAH Lithum Ion battery, 3.5 mm headphone jack inbuilt Google applications; Calendar, Gmail, Google Earth, Google Maps with Navigation,Google Search, Google Talk, Google Voice, Voice Actions and YouTube. Google and Samsung will launch Nexus S in US on 16th December. Nexus S will have both unlocked and contract based versions. The suggested market price for Nexus S is $529 for unlocked and $199 with a T-mobile contract. UK customers will get Nexus S on December 20th through BestBuy UK and Carphone Warehouse. We hope that Samsung will launch Nexus S in India too. With the latest conversion rates, it would cost 23000 INR and is very cheap for the specifications. Update: Nexus S price in UK: £550 unlocked or free with a 2 year long £35 pm contract. 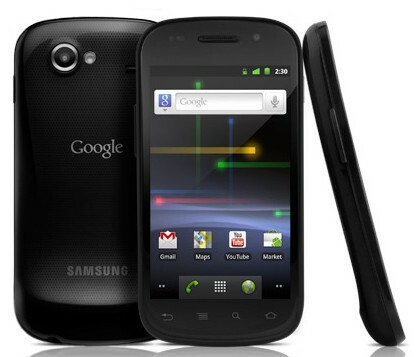 if google puts the nexus S @ 23k then what will happen to samsung Galaxy S which is prices @ 28k ? Dude, that’s purely based on the conversion rates. The official price of the Nexus S would be around 29-30K.